Buckwheat Kasha with Mushrooms is the perfect side dish because it’s so healthy! Is buckwheat a superfood? Maybe. It’s definitely an ancient grain, eaten for thousands of years. Buckwheat is most commonly eaten in Japanese soba noodles, or as an Eastern European Kasha. It apparently can help lower bad cholesterol, is high in protein, and is low GI. Russia is the worlds biggest producer of Buckwheat or Grechka (гречка), and it is a Russian staple. Buckwheat is not part of the wheat family at all, therefore it’s gluten-free, the name just tricks you! It’s actually a seed, and related to rhubarb. It got it’s name from a Dutch origin translation ‘beech wheat’ because it resembles a beech nut seed. Buckwheat is ‘healthy’ for us, and like all things that are ‘healthy’ it tastes like you would imagine ‘healthy’ to taste like. I’m not a fan of buckwheat. As a kid, mum would sometimes make buckwheat Kasha with milk for breakfast instead of porridge. I’d put in so much brown sugar to sweeten it up and make it edible for a kid, although I use much less sugar now! 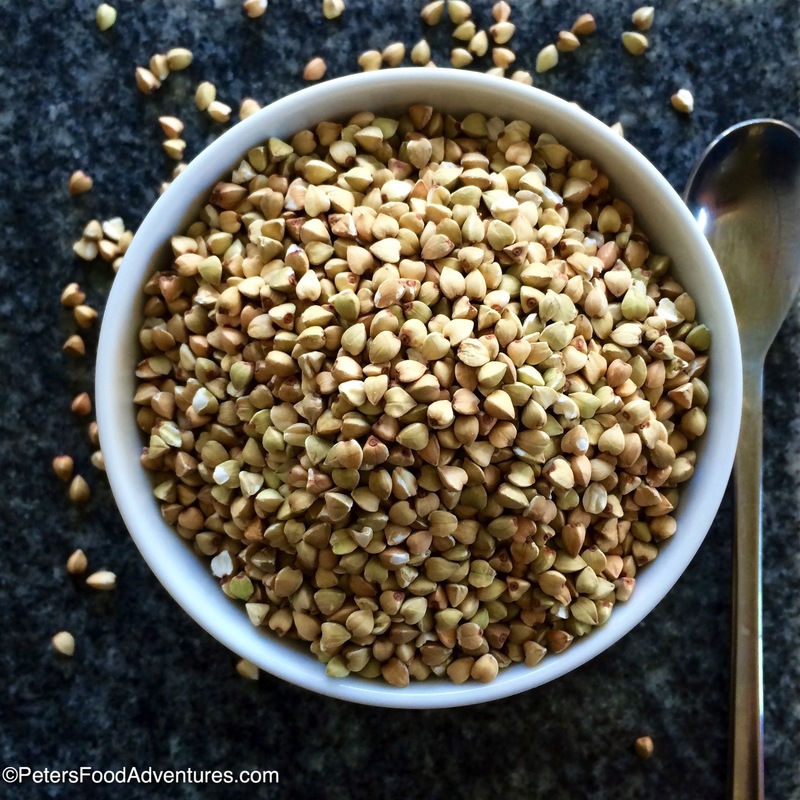 As I get older, and explore healthy foods, buckwheat is on the list. It’s now my job to share ‘healthy’ foods with my children. So how can I enjoy eating it? Buckwheat Kasha with mushrooms is pretty standard Russian food. I think this is a great side dish, think unprocessed Rice-a-roni. I always have smoked European sausage (kolbassa) in the fridge, or a Danish Salami, so it was a no brainer to add it to this meal. It also tastes great with bacon. Sometimes it’s hard to find buckwheat groats that have been pre-roasted, so I included instructions how to roast. If you don’t roast your buckwheat to make this recipe, your dish will turn out gluggy and not fluffy. So here’s a tasty buckwheat kasha with mushrooms dish you can add to your diet. Your heart will thank you for it! Bon Appetit! Приятного аппетита! In a frying pan, over medium heat, roast the buckwheat groats until golden brown, approx 5 minutes. Rinse the buckwheat and drain well. 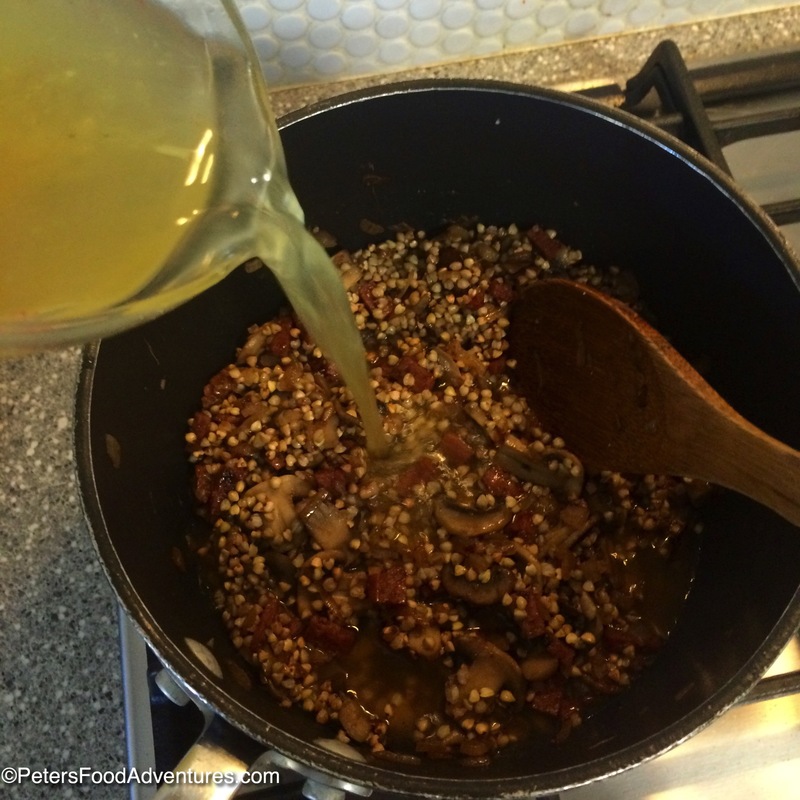 Heat 1 tablespoon oil in a frying pan and sauté for about 4-5 minutes, mixing and coating the oil with the buckwheat. Place buckwheat in a medium saucepan with a lid. Heat 1 tablespoon oil in a frying pan and sauté onions and sausage for about 2 minutes until onions start to sweat. 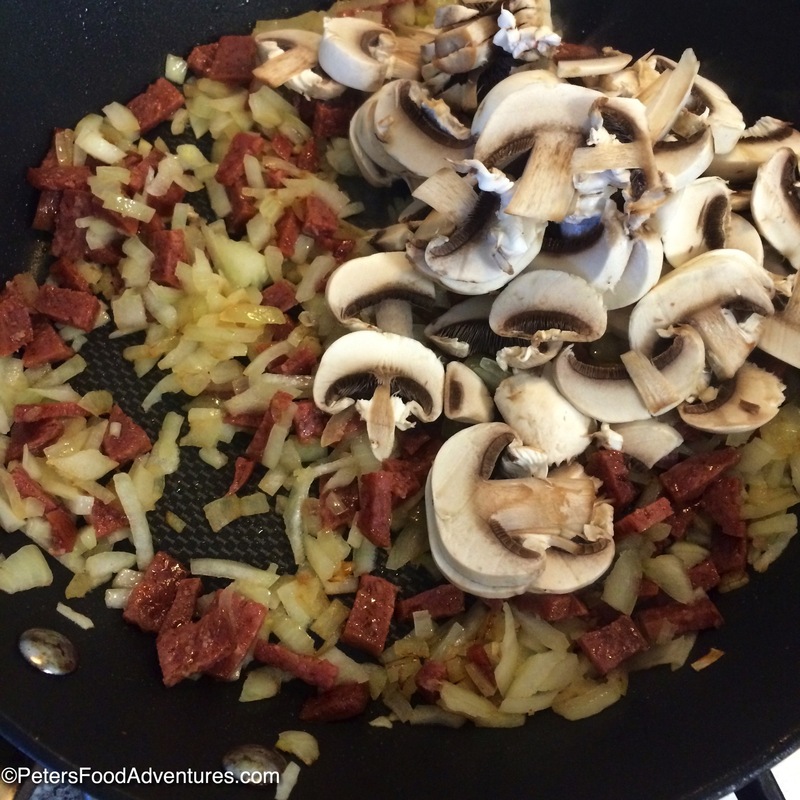 Add the mushrooms and sauté until they cook down and are soft. 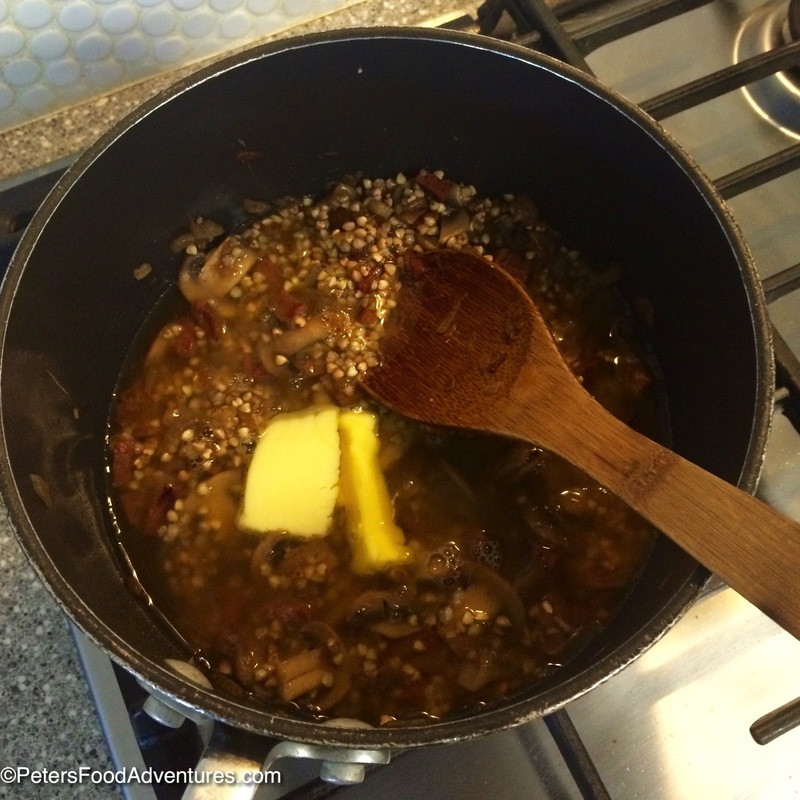 Add the mushroom mixture to the buckwheat and stir until evenly mixed. Pour the stock over the buckwheat mixture, add the butter and bring to a boil and reduce to low and simmer for 20 minutes, with the lid on. Just like making rice in a pot. Don't stir the buckwheat during this time. The buckwheat is ready when all the water evaporates and the buckwheat is soft and fluffy. 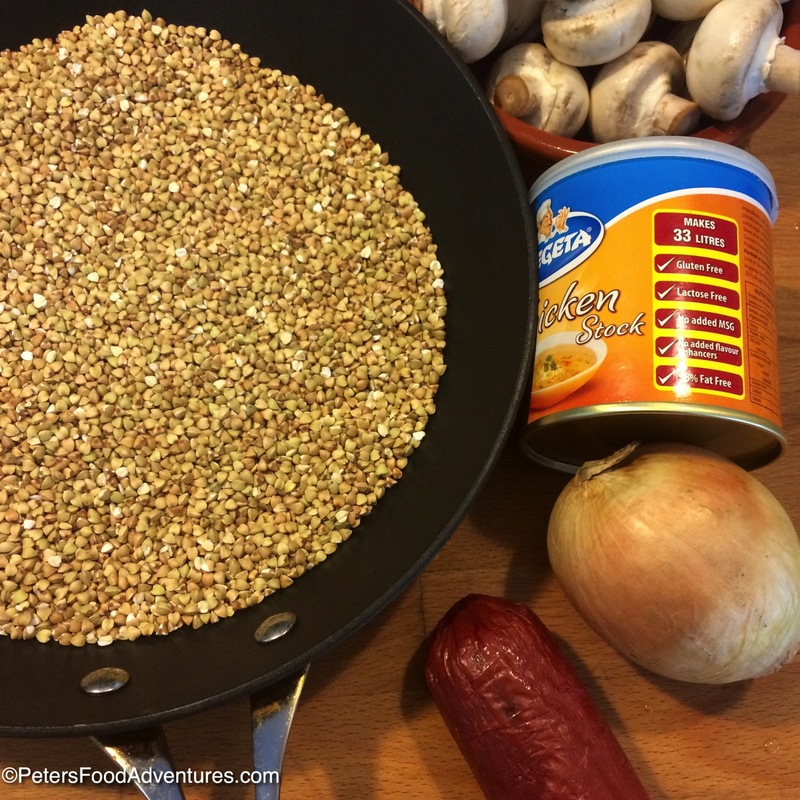 I like this Peter, interesting understanding exactly what buckwheat is, and a wonderful recipe! Thanks! Thanks Lynne, it’s also very filling like rice, but it’s not empty calories but full of goodness and health benefits…. I prefer this over the buckwheat porridge. I would have never figured it was related to rhubarb! strange!!! that is very strange! When i read that I thought hmm did I read that right! Very interesting! something new! 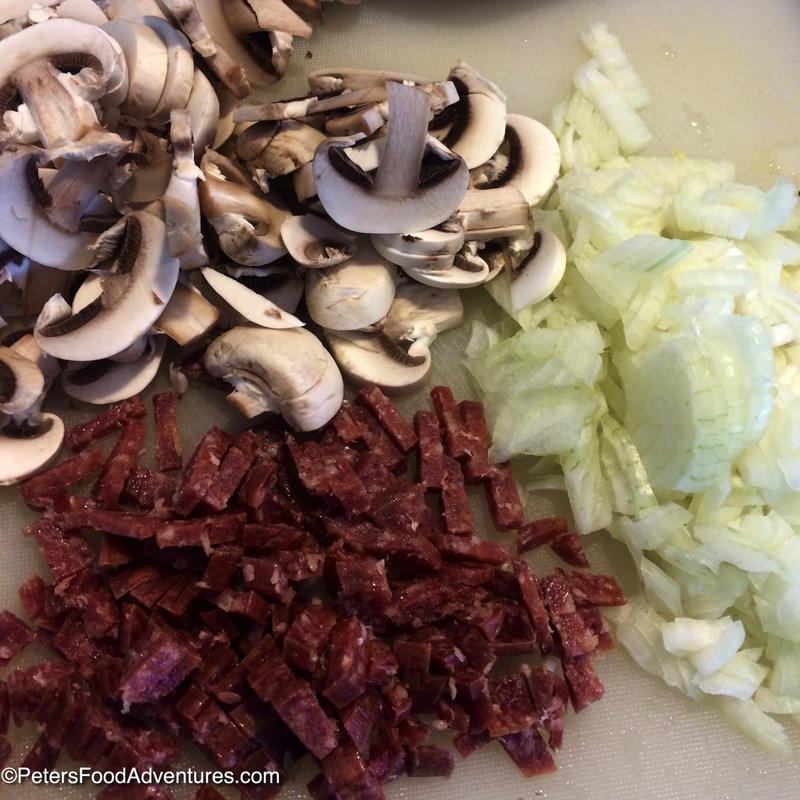 it’s also related to sorrel, another very Russian staple…. strange indeed! I love this. Something that I grew up with. I love asha. It cooks up quickly and has a genuine flavor. Thank you.